Editor’s Note: They say this is only being done in Baltimore, but let’s be honest with ourselves. This is probably going on across the nation. Baltimore Police didn’t bother to inform the public (or anyone, for that matter) when they implemented a privately-funded mass surveillance program in January using a wide-angle camera-equipped plane flying above the city — which instantly uploaded and stored everything it recorded, just in case they needed it later. As Bloomberg’s Monte Reel reports, a small Cessna plane equipped with “a sophisticated array of cameras” capable of capturing “an area of roughly 30 square miles,” funded by an a private donor and provided by Dayton, Ohio-based Persistent Surveillance Systems, sometimes circled above the city for up to 10 hours per day recording and storing everything without anyone being privy to its presence. Gone, apparently, are the days when the government’s surveillance state drew ire for attempting to ferret out potential terrorists — residents of Baltimore have been guinea pigs for an altogether more insidious spy dragnet. 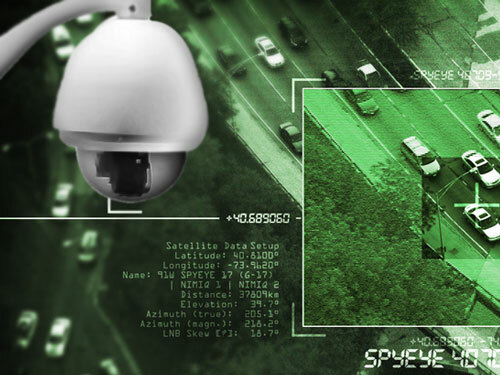 Persistent Surveillance Systems’ technology automatically stores all the footage on massive hard drives, making it available to law enforcement long afterward — but the idea police could access this information to solve a simple property crime is no less than alarming. Particularly considering the company’s founder has an intense military background. Over time, after McNutt retired from the military, he worked to further improve the camera array and attended security conferences in hopes of garnering clients. After a brief but effective test run over the skies of Ciudad Juárez, Los Angeles became the first U.S. city to employ Persistent Surveillance’ system — and just as covertly as what has been taking place in Baltimore for the last eight months. In 2012, the Los Angeles County Sheriff’s Department decided to conduct a trial of the system, launching surveillance over the Compton neighborhood for a total of nine days to determine if a contract would be desirable. Although the department ultimately decided against a long-term contract — citing quality in recorded footage as a detractor — the brief experiment had sharp repercussions when citizens learned about the covert project a full year afterward. Protesters demanded a “citizen privacy protection policy” from community leaders against such overarching intrusions by police, but as Bloomberg notes, none of those leaders — including the mayor — had been informed the about surveillance system flying overhead. McNutt next attempted to a contract with his own city, Dayton, after vastly improving both the cameras’ resolutions, as well as the archive storage capacity and image processing capabilities. While Dayton police and city council jumped at the opportunity, controversy exploded during public hearings. “At the hearings,” recalled Joel Pruce, who teaches human rights studies at the University of Dayton, “nobody spoke in favor of it except for the people working for the city. Dayton promptly scrapped their plans for Persistent Surveillance’ system after those hearings. After the public radio show, Radiolab, aired a segment discussing Persistent Surveillance, Texas philanthropists Laura and John Arnold — John is a former Enron trader — contacted McNutt with the proposition to fund several months of his service if he could locate a willing city. Since McNutt had met the Baltimore police lieutenant in charge of the city’s ground-based surveillance camera system at security trade shows — and because the atmosphere in the city had just exploded following the death of Freddie Gray in police custody — the decision was easy. Baltimore has already dealt with an excoriating report from the Justice Department on the city’s policing practices and a recently-filed lawsuit with the FCC over law enforcement use of another invasive technology, Stingray, which mimics cell towers for tracking purposes. McNutt believes in the legitimacy of the services Persistent Surveillance can provide, and insists the technology isn’t as invasive as it might sound since individual identifying details, among other aspects, aren’t discernible, and because the every keystroke and action taken by analysts — like video footage — are logged and archived. Still, this sort of surveillance — vague though it may be — undoubtedly represents yet another incremental incursion into people’s private lives. And we all know where that slippery slope leads. This entry was posted on August 26, 2016 by conspiracyanalyst in Science & Technology, Society, Surveillance, US News and tagged government surveillance.